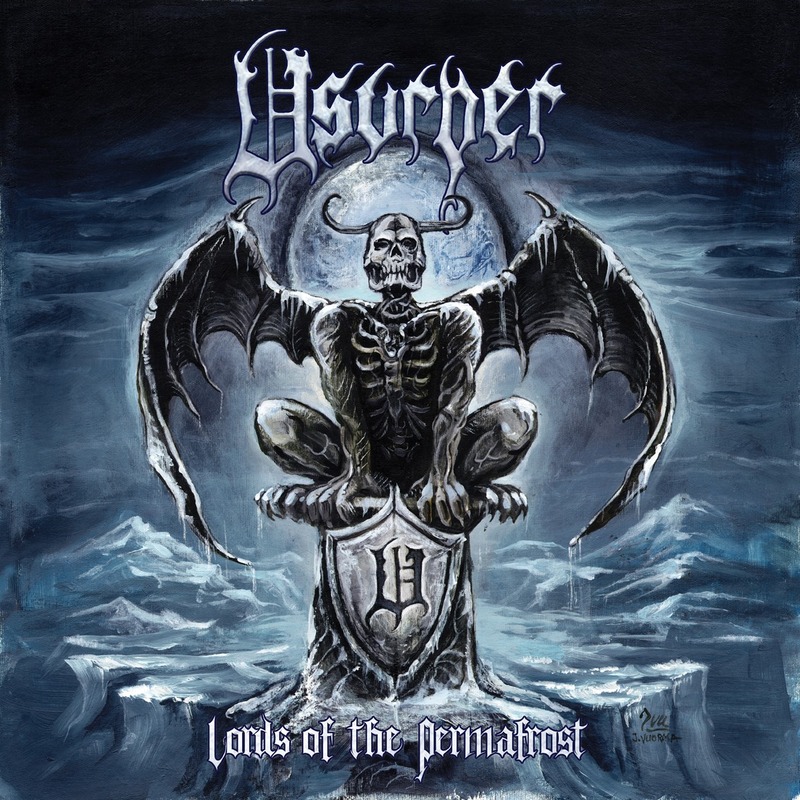 It’s an excellent time to analyze Usurper’s contribution to metal before we go ahead and look at this reunion album, released 14 years after Cryptobeast. Beginning life as a borderline black metal band obsessed by Celtic Frost, the Chicago group embraced the weirdly sludgy side of black thrash during a run of five initial albums, culminating in the 2005 effort that introduced Dan Tyrantor to the fans. Despite Tyrantor sounding less distinctive than his predecessor, General Diabolical Slaughter, all of those albums paid fairly direct homage to their influences, often including at least one song that referenced metal in the lyrics and delving deep into the barrel of death grunts and swampy guitar tones. For a quartet with such seemingly fixed points of reference, not to mention a largely unique sound, old fans might be intrigued to find that Usurper’s return brings with it some minor points of evolution. Some may view the sonic qualities of Lords of the Permafrost to be merely a continuation of the movement found on Cryptobeast and, while true that the 2005 full-length still bears the closest resemblance, Usurper have managed to tease out some of the knots from their style. The manner in which this has been orchestrated equates to a loosening up of the Celtic Frost worship and a heavier application of typical black thrash principles. In the past, comparing Usurper to Aura Noir and the Norwegian scene seemed redundant, as did their relevance to German bands like Desaster and Sodom, largely because the Americans eschewed necro or underground traits, playing with a sense of fun and sloppiness more akin to the Japanese likes of Abigail, though certainly with nothing like the same focus on punk. The general weight of a Usurper recording tended to squash notions of “normal” black thrash. Fear not, because that largely remains true of Lords of the Permafrost, yet the basis of several of the songs utilizes tempos, riff ideas, and even melodies from appropriately frosty environs. Then again, the syrupy strains of uncategorized death/sludge/doom still lurk around breakdowns and stick strongly to cuts like “Beyond the Walls of Ice”. Another feature separating the new material from what came before is how serious Usurper sound much of the time. Granted, one can’t imagine Tyrantor pulling off so many of the “party death grunts” that littered Necronemesis and quite a few live shows, but his death metal roar dries out the experience from a vocal perspective. New bassist Scott Maelstrom contributes a load of ballast too, sounding stern and gruff as he weighs down the riffs like concrete blocks. The old hands, too, ensure that the cold environment suggested by the album title communicates itself effectively – not through freezing riffs as with purer black metal, just by slowly drying your skin off. The percussive beating of the mid-paced cuts feels rough enough to claim at least a few days injury leave from work, “Cemetery Wolf” thrusting a fist resolutely into the listener’s cheek until Rick Scythe takes mercy by contrasting a little melody with the pummelling. For those who enjoyed the former sounds of Usurper, this kind of brutish slugger earns its place alongside the more refined likes of the title track and “Warlock Moon”. Both elements combine on occasion, “Mutants of the Iron Age” tumbling from rabid thrash into thick chugging verses, while “Gargoyle” proves so moshable that it’s almost danceable, the string players swinging each other round by the hand in a delightful circle pit of exchanged ideas. The structuring of either style revolves around repetition and impact, only the surprisingly delicate acoustic introduction of “Skull Splitter” suggesting that the four-piece has a wider range of skills than hitting each other with distortion and violence. As a moderately brief album, Lords of the Permafrost doesn’t outstay its welcome, nor do any of the eight songs let the team down. “Black Tide Rising” might be the weakest, mostly down to a lack of momentum or broad crush, preferring to head over to a breakdown rather than toss another crunchy riff out. Having spent so long away, Usurper may actually make bigger waves upon their return, seeing as no pretenders to their peculiar spot have come along since. The same old doubt still nags slightly that their chosen style fits together rather raggedly, especially concerning the skilful quicker riffing and the swampy slow sections; nevertheless, the way in which they manage to clobber the listener regardless of pace remains a useful feature. Even if the White Walker lookalike on the cover can’t whet your appetite for the new Game of Thrones, the unique qualities of Lords of the Permafrost should win a place in your album collection. This entry was posted in Black Metal, Featured Review, Reviews, Thrash Metal and tagged 2019, Abigail, Aura Noir, black thrash, Celtic Frost, Death Grunt, desaster, Game Of Thrones, lords of the permafrost, Reunion, sludge thrash, Sodom, usurper, white walker.